This is Issue Two of Comics Squee. Each month our podcast panelists, bombarded by gamma rays, squee about comic books, graphic novels, and general sequential art geekery. I’m your host, Chriss Cornish. Joining me are regular squeesters April Taie and John Oliver. Taking the revolving 4th chair this issue, is our guest Feliza Casano, who is the Founder and Chief Editor of Girls in Capes, a pop culture web magazine focusing on underrepresented groups in science fiction, fantasy, comics, etc. This issue of Comics Squee we’ve got: a steampunk-cyberpunk adventure mini-series; the old school Marvel tabletop Role Playing Game; an Eisner Award winning fairytale series; and the Avatar Last Airbender graphic novel. John played the first version of the Marvel tabletop RPG back in the day, which allowed people to create their own heroes to adventure in the Marvel universe. John ran games for his friend, who created a superhero version of himself called the Silver Spur. They had fun until the Silver Spur decided to stalk Captain America and Diamondback while the duo were out on a date and John, who was Judge/GM, rolled a double 0. The lesson? Do NOT mess with Diamondback’s love life, kids. 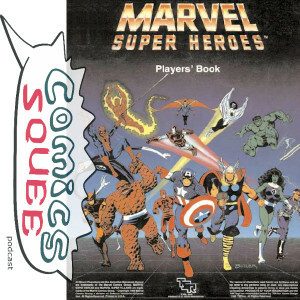 Chriss had played a later version of the Marvel Super Heroes RPG. To determine your character’s powers you’d roll dice and look up the results on a chart. The powers Chriss had rolled for her character where 1) shooting projectiles from her finger tips, 2) turning into an owl, 3) turning into a gold fish. Only one of those powers actually came in useful… Turning into a gold fish (her character swam down the sewers to escape the villain’s lair). April also has played the Marvel tabletop. Her character had the power to detach their appendages, and to take other people’s arms and legs and put them on herself. Reminding Chriss and Feliza of Arms Fall Off Boy, an old DC character from the Legion of Superheros who’s always on the top 5 lists for worst super powers. John, though, was reminded of an issue of Alpha Flight with Nemesis where the villain got hit by a train but his arms kept crawling after the heroes. The game books are a little hard to get ahold of these days and tend to sell online for about $40. There are PDF versions available out there. Copyright is a bit uncertain at this point. Digital rights didn’t exist at the time the books were published since there was no internet yet (that’s right, kids, everyone on the podcast this issue is older than the internet). Feliza Casano: Avatar: The Search Part Two by Gene Luen Yang, et. al. We have a Spoiler Warning on this one. 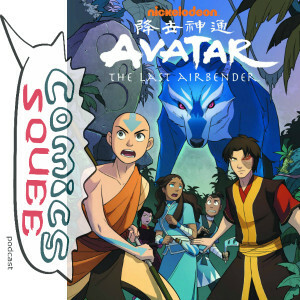 This is the second volume of the current trilogy of Avatar: The Last Airbender graphic novels. They are set after the end of the TV series and deal with Zuko’s search for his mother, with his sister Azula along for the quest. The real search is Zuko’s quest to discover where he belongs in the world. Again, spoilers. This is an exciting and unique comic book miniseries from Dark Horse. It’s set in a world that’s a mix of cyberpunk and steampunk that works really well. The main character, Amala, is a warrior assassin. She’s haunted by the ghosts of all those she’s slain, though they don’t reveal until the 3rd issue whether she’s really seeing the ghosts or if they’re in her head. Issue #0 starts with Amala sneaking through a pirate ship to assassinate the captain, talking to the ghost of her father. And you’re wondering if she’s seriously talking out loud to this ‘ghost’ while creeping around, when one of the pirates attacks her and asks why she’s talking out loud to herself. It’s great stuff, very exciting. Our conclusion was that Amala’s Blade would make a great video game and we’d love to play the heck out of it. 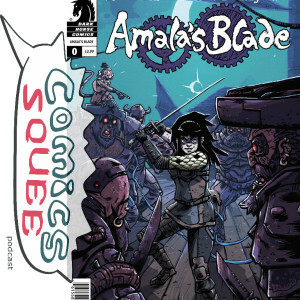 All four issues of Amala’s Blade, five if you count #0, are out right now. The trade edition will be released January 22, 2014. The pre-order deadline is this October 21, 2013. This Eisner Award winning graphic novel is a feminist take on fairy tales. It’s set in Sleeping Beauty’s castle, after Sleeping Beauty has left to live with her prince. The castle becomes a sort of way station for various people trying to find their way, and they form a family for each other. 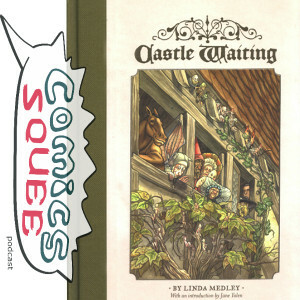 Castle Waiting presents some different takes on fairy tales and nuns. Question Time: What’s Everyone’s Favorite Comic Book Movie? Does NOT have to be based on an actual comic book. Play along at home. Chriss: Who Framed Roger Rabbit?, which is the comic bookiest of all movies. Feliza: Spider Man 2003. Feliza hadn’t read comics at all before seeing this movie back in 2003 and this movie changed that. She wanted to Peter Parker. She was Peter Parker, to a degree; awkward, picked on, outsider. John: Unbreakable starring Bruce Willis and Samuel L. Jackson. April: Had two movies. The Phantom, a pulpy romp she named her favorite because young Billy Zane in tight clothes. And Hellboy because she felt it did a good job of bringing the comic to the big screen. John didn’t quite agree with her, though, since he felt the Hellboy of the movie was a lovelorn teenager while comic book Hellboy was a seasoned pro. But all agreed Hellboy was a fun movie. We took a break to thank our media hosting sponsor, Greta C. While our squeesters were refreshing their parched throats with some water, we played a mini-squee recorded in the fannish wilds. This one was squee-corded at Chriss’ 2013 Read Comics in Public Day Celebration in San Diego and featured Matt Dunford talking about Little Fish comic education studio in Ocean Beach. Feliza: Really looking forward to part 3 of Avatar: The Search. It comes out in October and Feliza can’t wait to see if her theory about what happened to Zuko’s mother is true. Chriss: Rat Queens #1 from Image. Comes out September 2013. 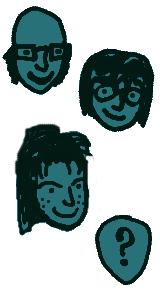 A dungeon crawler adventure with an all-female team. Backstory is there are so many adventuring teams in town, having bar fights and being rowdy, that the sheriff gives each team a task to get them to go away. Chriss read a preview of the comic on Comics Alliance and it looked like fun. John: Reading Helheim #4, a Norse viking adventure story about dueling witches whose servants start to rebel. April: Wormwood: Gentleman Corpse from Darkhorse. April didn’t really know what the comic was about, but a friend handed it to her and said she’d enjoy it. She’s looking forward to reading the book because the art looks both pretty and scary, which is totally her thing. There’s also tentacles on the cover, which hints that Old Ones will show up at some point.